Does it seem like retirement can't come soon enough? Are you tired of feeling like you're wasting time at a job you no longer enjoy, daydreaming about the day you won't have to come in anymore? It's easy to go on autopilot with monthly costs, but they can add up fast, especially if you're spending more than you should. By switching providers for home or car insurance, Internet, phone, and cable TV, you could save thousands a year. In fact, do you even need cable TV? What about that gym membership — are you using it enough to justify the cost? Could you trim expenses even further by downsizing your home or getting by with one car? Leave no monthly cost unexamined. While you're at it, look at the fees you're paying on your investments. Because of compounding, investment fees that seem small can eat a big chunk out of your retirement savings over time. When planning for retirement, it's important to consider the taxes you will have to pay once you stop working. While you can contribute now to 401K or regular IRA accounts using pretax income, you'll have to pay taxes on the distributions once you start to draw down the accounts. On the other hand, you contribute to a Roth IRA with money that's already been taxed, but then it grows tax-free and you'll pay no taxes when you withdraw the money. Often it's good to have a combination of both types of retirement accounts. A financial adviser can help you decide. But keep in mind that withdrawing from either of these accounts before you hit age 59-1/2 usually incurs a tax penalty. Taxes on Social Security are another expense to keep in mind for when you hit official retirement age. Social Security benefits may be taxed at the federal level, depending on what your total income is. But the IRS won't tax more than 85% of your benefits. Thirteen states tax Social Security benefits, while other states have low or no taxes for retirees. Retiring early means figuring out a way to live on what you save during a shortened working career. You can lower your needs drastically by changing your country code. If you've been working and saving in U.S. dollars, you can make that money go much further in a country where the cost of living is lower than in the United States. Many destinations in Central and South America, as well as many parts of Asia and even Europe, are much less expensive for Americans to retire to — and if you're looking for a warmer climate, you can find that too. Of course, there are some logistics that you should take into consideration when retiring abroad. The U.S. taxes citizens or resident aliens living abroad on worldwide income, including Social Security, other retirement income and any earnings you may get from working in your new country. However, you may be eligible for the Foreign Earned Income Exclusion, which allows you to exclude foreign earnings — up to a certain amount — from your taxable income. The exclusion is adjusted annually for inflation. For 2017 it is $102,100. You may also be subject to income taxes in the country where you retire, though many countries have treaties with the U.S. that make sure you are not double taxed. You'll need to research local tax laws to make sure you're in compliance. There are a lot of logistics involved in moving to a foreign country. You'll need to research the appropriate visa for the country you'll be living in. Many desirable locations for Americans have special visas for retirees. Generally, you'll need to show you have a certain amount of retirement income and you will not be allowed to work for a local employer on these visas. Think too about whether you want to sell your home in the U.S. You may want to get rid of furniture and other belongings as well, though retirement havens such as Panama and Nicaragua allow you to import a certain amount of household goods duty-free. Banking is another consideration. Many expats continue to hold a U.S. bank account and to transfer money between it and an account in the country where they live. If you've got a U.S. account it's also a good idea to have a U.S. travel credit card that charges no foreign transaction fees. A U.S. card can help you purchase from U.S. websites more easily and comes in handy during trips back home. In some countries, quality health care is so cheap that expats choose to pay out of pocket for treatment and medications. In other cases, you will need to research local health insurance options or make sure your U.S. insurance covers care abroad. Medicare is not available for health care outside of the U.S.
Other expats can be a great resource as you try to find doctors that speak English and have a good reputation. The U.S. State Department has more resources for planning to retire abroad. You can also considerably lower your retirement expenses just by spending a portion of the year abroad, without the commitment of leaving the U.S. entirely. Different people choose to set up this arrangement differently. Some will return to the same place every year, while others may prefer to try out somewhere new. As with moving abroad full time, you will still be responsible for paying U.S. income taxes on worldwide income, and you may be subject to local taxes as well. Many tax breaks in the U.S. and abroad are dependent on how many days per year you spend in the foreign country, so you'll need to research those requirements. The most important consideration when you'll be spending your time in multiple locations is your accommodations. Will you rent your home while you're away? Will you hire a property manager to make sure that everything is running smoothly in your absence? Consider home or apartment exchanges if you are going to be overseas for a shorter period of time. For health insurance, you may want to consider purchasing travel insurance for the part of the year that you'll be out of the country to supplement your plan back home. 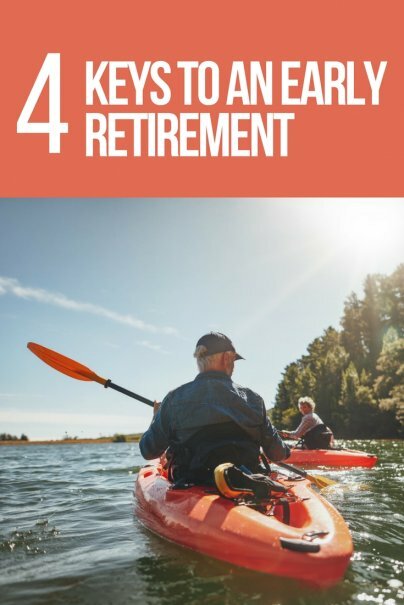 Early retirement doesn't have to be an unattainable goal. Focus on setting your priorities and using creative thinking to be able to retire when you want.